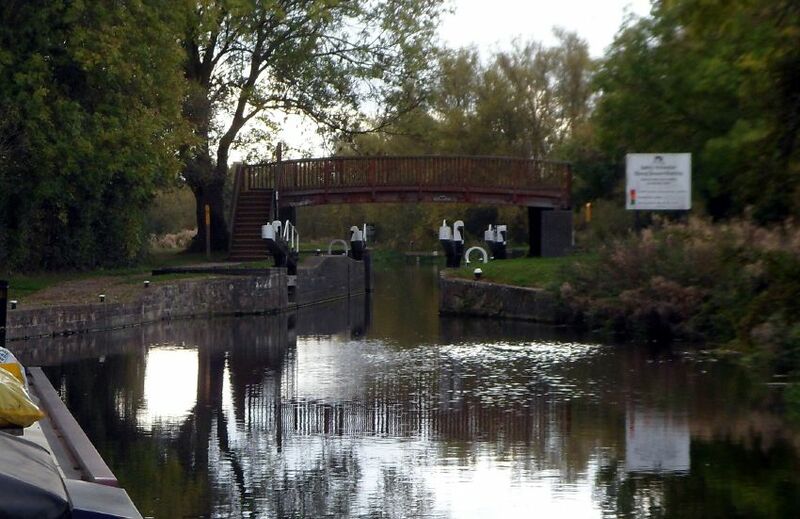 We don’t generally do marinas, but we quite like Pillings Lock Marina as a temporary stopgap when we’ve things to do in the Soar Navigation area. We came in on Friday morning, slotting into a space on the dedicated visitor moorings. We’ve got a gap either side of us, so we’re not peering at another boat when we open the curtains. Coming in to Pillings Lock Marina. But I’m getting ahead of myself. On Thursday we stayed put at Barrow, a fine day after early mist. 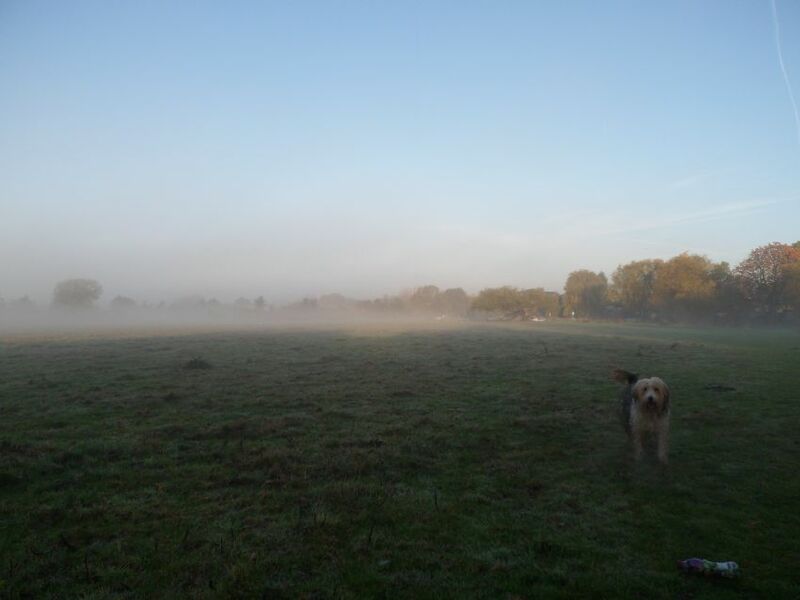 I took Meg out first thing and got these photos….. 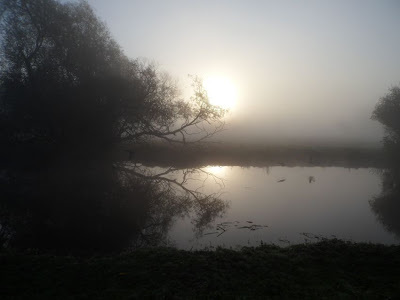 The sun starts to show through the mist…. ……And ducks flying along the river. Moored at Meadow Farm Marina, this chap’s just lit his fire. The sun just breaking through, turning the silver grey to green. We just pottered about for the rest of the day, enjoying the sunshine. Friday, as I’ve said, we moved downstream through Barrow Deep Lock and Pillings Flood Lock, now in use for the “rainy” season, and moored in the marina. I collected a car from Enterprise in Loughborough, taking advantage of the “We’ll pick you up” offer, and did a bit of shopping on the way back. 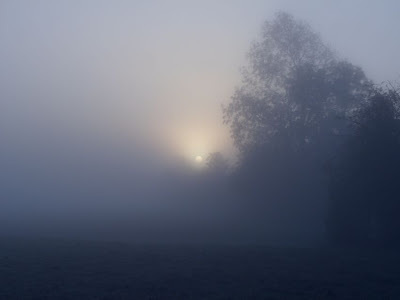 It was nice to wake up at 06:30 on Sunday, with the sun just brightening the sky. We were on the road at 07:45, and an hour and 15 minutes saw us parked up in Worksop. The half-marathon here is a small event compared to the “Great Runs”, but for all that it’s well organised and the route takes the runners out of the town and through Clumber Park before returning. 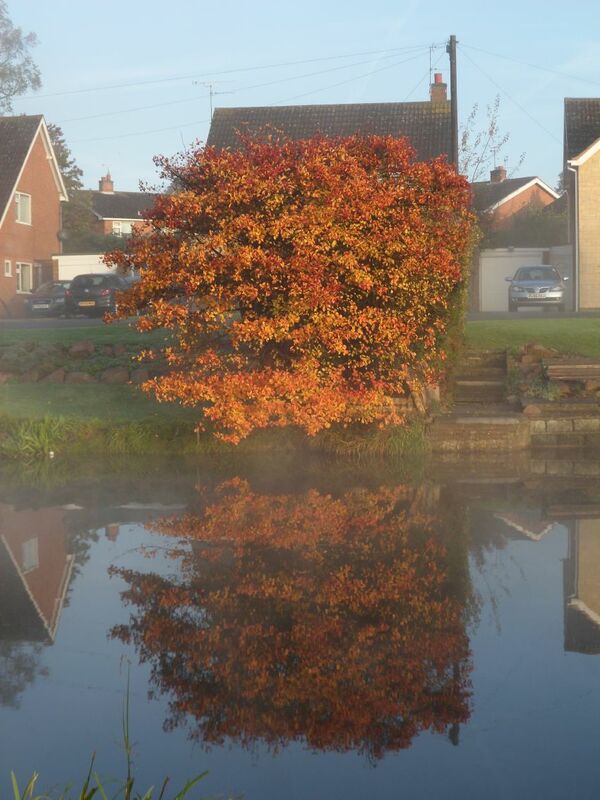 At this time of year it’s a beautiful run, with the trees in a variety of autumn shades. Sorry, too busy for photographs though. I’d entered this race as an afterthought, being a bit disappointed with my Great North Run performance. I’ve not run it since 2006, and as such had limited memories of the course. I’d forgotten it was so hilly! 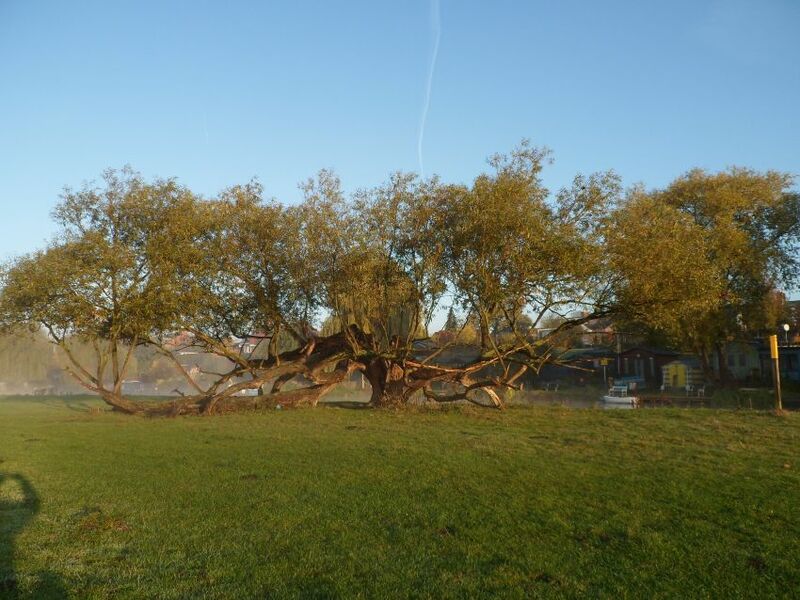 The write-up calls it “undulating”. Undulating hills, I reckon. Anyway, I usually get wound up the few days before a race. Silly, I know. It’s not as if I can compete with the big boys. But this time I stayed relaxed and unstressed, intending just to enjoy myself. And that’s just what I did. The bonus was that I also got a satisfactory time, a Personal Best for this course, coming in 860 something out of 2000 starters. So I can now pack away my running gear till after Christmas, when I’ll start training for next year’s events. I’ve already entered the Manchester 10K (in May) and I‘m waiting for the entries to open for Great North Run. We did a bit of shopping today before I took the car back. 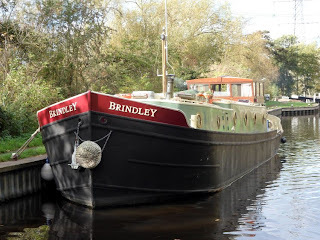 Tomorrow we head out onto the river/canal again, heading towards Birstall. Meg is due for her annual boosters and check-up, so I’ll take her to Borrajo’s in the village. Then we’ll turn around, aiming to be around Mountsorrel next Friday. Tuesday night was quiet at Mountsorrel. At least until 06:00 when Meg woke us up barking at the window. Those who’ve come this way will probably remember the “kissing gate” at the end of the moorings, letting into the adjacent field. An angler had turned up for a spot of early morning maggot drowning, with a trolley full of paraphernalia. Not being able to negotiate the gate with the gear aboard he had to offload it, take it through, then manhandle the barrow over the fence. Then it was a case of reloading it all again. All accompanied by muttered curses. An interesting five minutes. 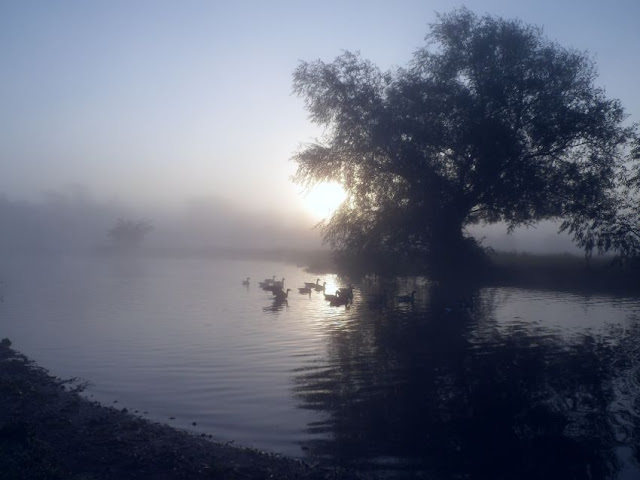 It had been a cold night, and early mist was hanging on the water as I set off for my morning run. I was a little earlier than Tuesday; then I‘d had to weave in and out of groups of kids heading for school. On this occasion I only came across the isolated “swot” heading in early. That’ll be my last training session before Sunday and the Worksop Half Marathon around Clumber Park. 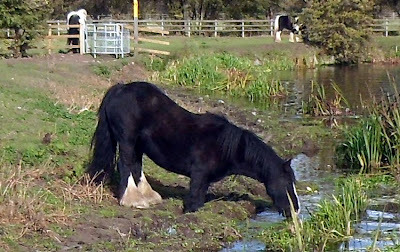 I’ve been nursing a bit of an injury for the last few weeks; three days off should see it improved and me “hot to trot”. 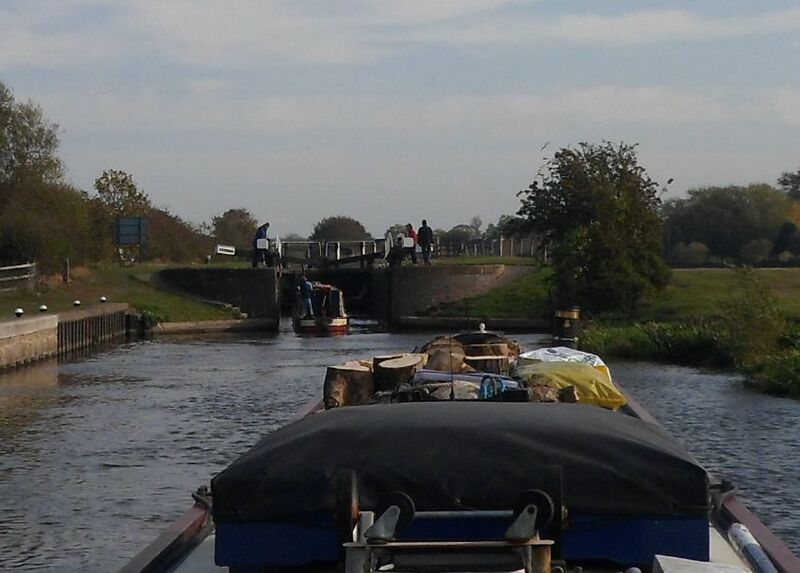 Around lunchtime a boat came up the lock so we took advantage of their idleness in leaving a top gate open. The granite quarry sits over Castle Hill above Mountsorrel, and the conveyor carries the chipped stone across to railway sidings between Barrow and Sileby, two miles away. This conveyor runs on the track bed of The Mountsorrel Railway, completed in 1861, and built for transporting the product of the quarries. The stone produced here is still in demand, it’s pinkish colour making it sought after for decorative and monumental use, and it’s hardness making good roadstone. 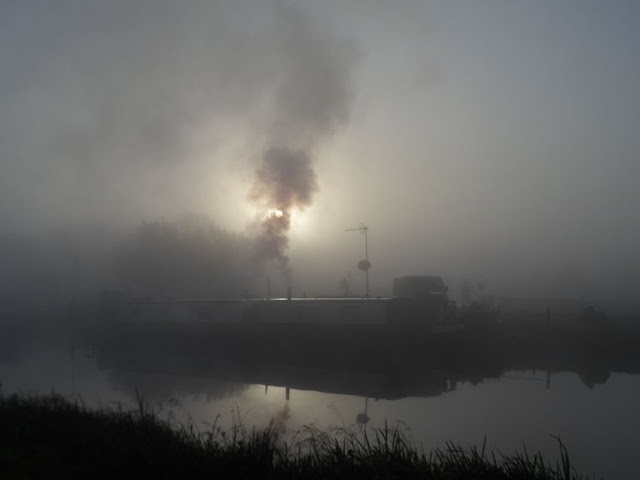 The railway was soon carrying in excess of 200,000 tons of stone a year, effectively ending the previous barge and horse-and-cart transport solutions. It closed around 1959. 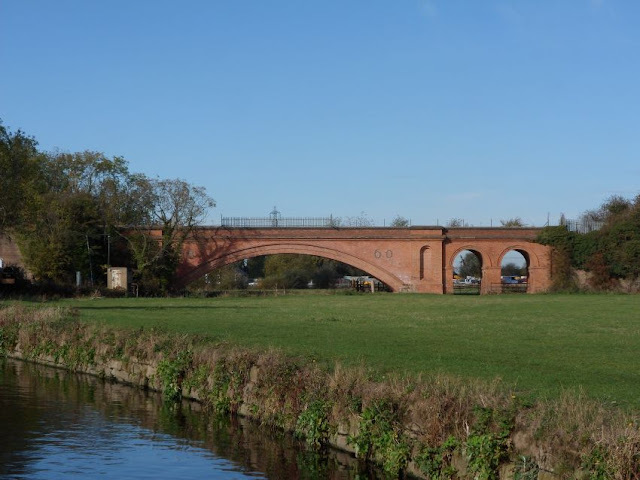 The bridge is believed to be the longest single-span brick arch in the country, 40 feet wide and 16 feet above the river. The other side of the bridge there’s a few boats moored on the offside, one of which was built by Fibreline. 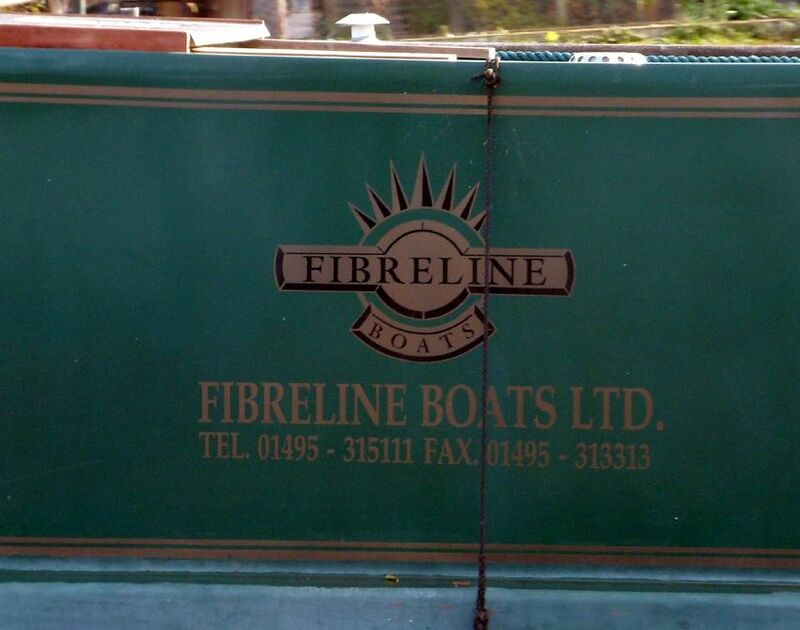 This Gwent company built a few fibreglass narrowboats, but ceased trading in 2002. It’s a very pretty stretch downstream of Meadow Farm Marina, with the smart houses on the edge of Barrow on one side and open grazing on the other. 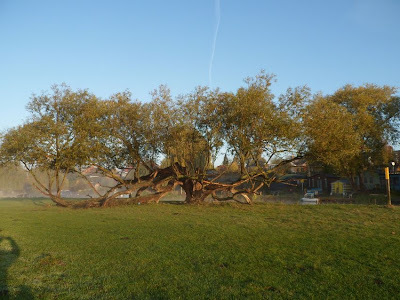 Well cracked Crack Willow near Barrow. 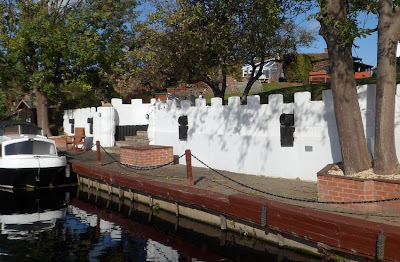 I always have a chuckle when we pass this riverside house with mock gunports in a fortified wall…. 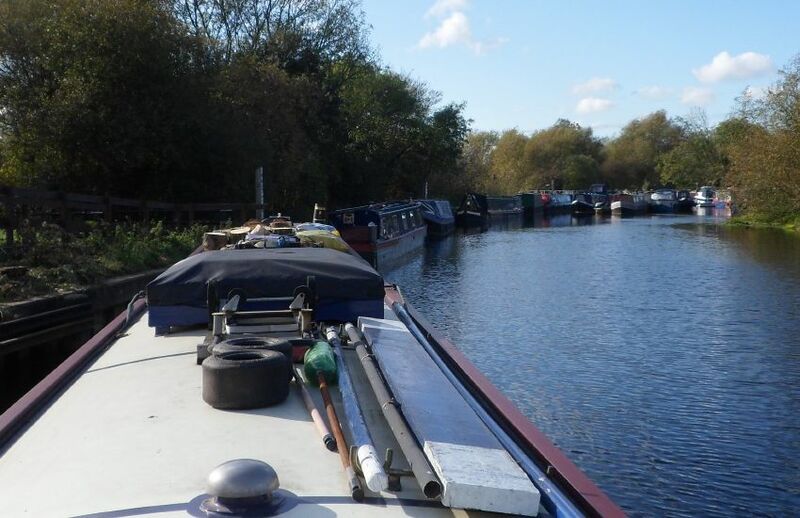 We were aiming to moor just below the weir at Barrow, there’s just room for two boats on these 48 hour moorings. It’s a lot more pleasant here than in the lock cut. Unfortunately there were two boats already there, but the one nearest the weir was Corbiere, so we shuffled in close behind, with the fore end against the hard edge and the stern hanging just short of the weir. Probably not the best spot if the river is up…. 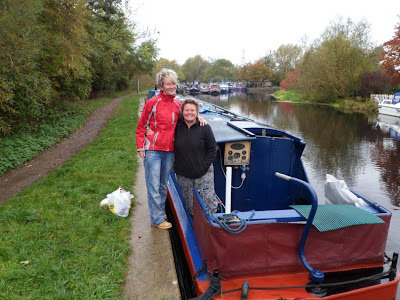 Carol and Amanda were off shopping when we arrived, but we were met by Dave and Dilys off NB Trundle. 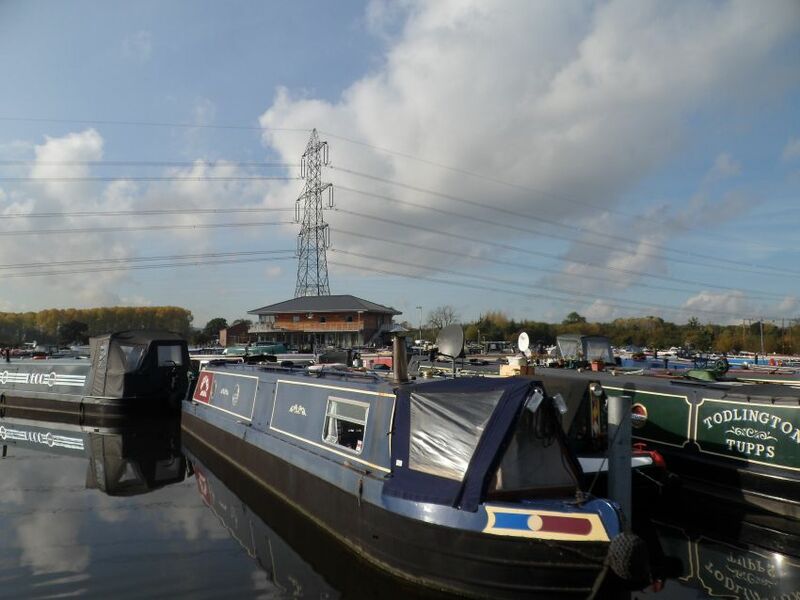 They used to manage Raynsway Marina till it changed hands last year and they were unfortunately made redundant. It was good to catch up with them. The girls joined us for a drink in the afternoon, then we took the dogs for a walk across the fields later. 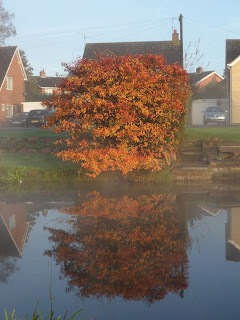 They’ve got to be back in Shardlow by the weekend, so they set off this morning, after the early rain had stopped. The dogs had to come and say goodbye, too. We pulled forward into the vacant slot. Mags was a bit worried about being so close to the weir, and lack of depth meant the stern was stuck 3 feet from the bank, so we’re better off now. 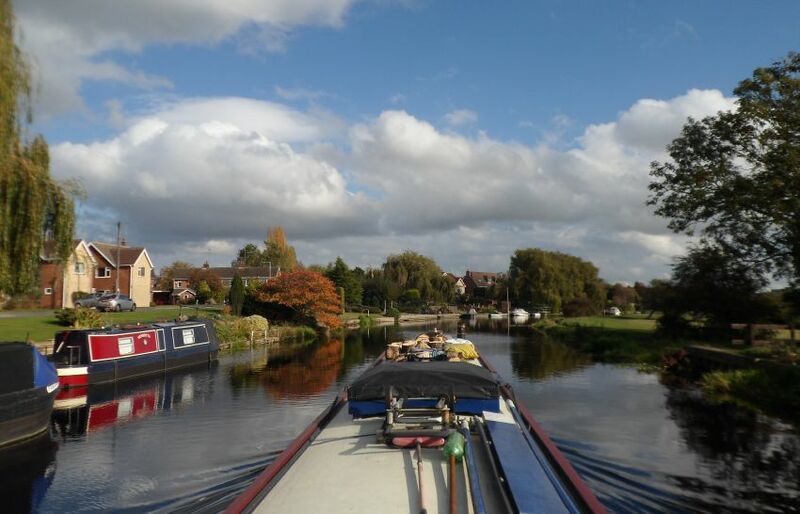 Tomorrow morning we’ll head the short distance to Pillings Lock Marina, where we’ll be staying for the weekend. Oh, and apologies to Maggie. 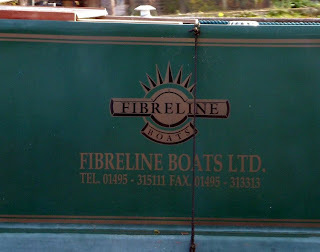 I called their boat "Forevermore" the other day. My brain cell must have had a senior moment. Of course it's called Forever Young. Corrected now. We had just a short one today. After rain overnight it wasn’t such a bad day, the wind is quieter and we had a odd glimpse of the sun. We rejoined the river just after Pillings Flood Lock. 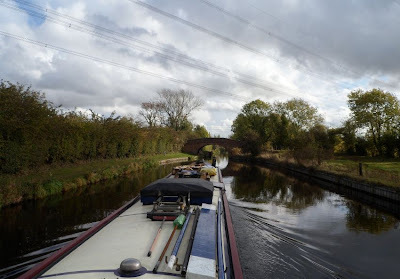 The contrast between the artificial and natural channels is marked…..
From the cut south of Loughborough…..
Back onto the river heading for Barrow upon Soar. Just below the Flood Lock the river heads off on it’s long loop around the town, reconnecting with the navigation below Bishops Meadow Lock. The Loughborough and Leicester Navigations were built to service the town, so they were cut on a more direct route. There’s a rotating flood control weir here, as well as the flood lock. 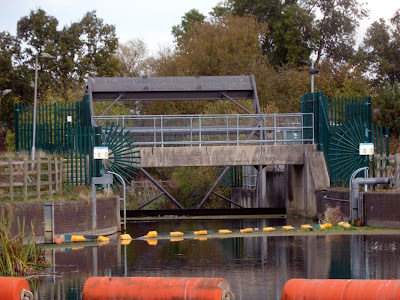 Automatically opening as required, it allows water that can’t get over the conventional weir to be dropped into the river course quickly, preventing flooding of the canal through Loughborough. There’s another similar structure downstream at Normanton. The Soar is notorious for rapid rise during heavy rain. 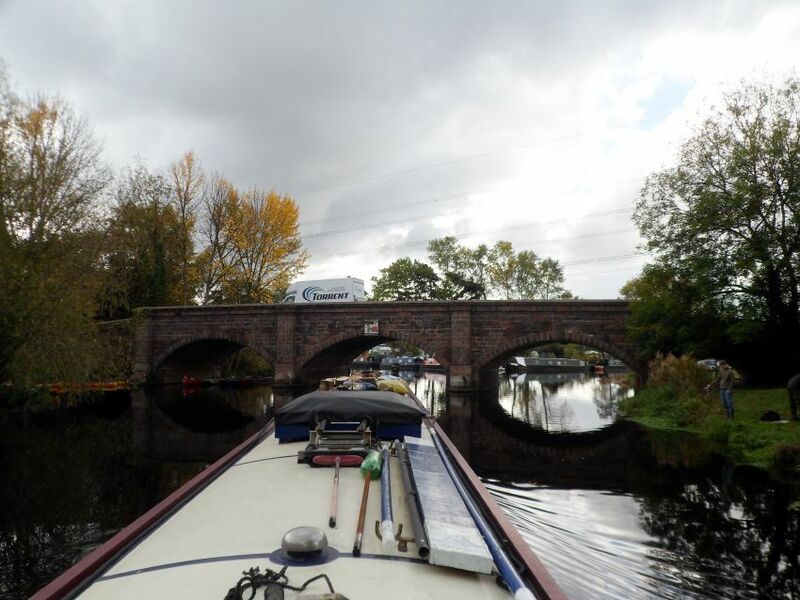 The turn into Barrow lock cut is a left turn just under the arched Barrow Bridge. Awkward when the river is running fast, it was a doddle today. Barrow Bridge. The navigable arch is the middle one. Barrow Deep Lock is aptly named! She’s a fine looking vessel, nevertheless. I’d like one of these to moor outside of one of those houses at Redhill, please. We filled and emptied the respective tanks at Barrow Boating, meeting Maggie on NB Forevermore Forever Young while the hose was on. She introduced us to Alex, another boater moored in the basin here. We just pulled away when I spotted NB Trundle nestling against the wharf. This is Dave and Dilys’ boat, who used to manage Raynsway Marina at Thurmaston. We pulled over so I could pop back, but there was no-one home when I knocked. 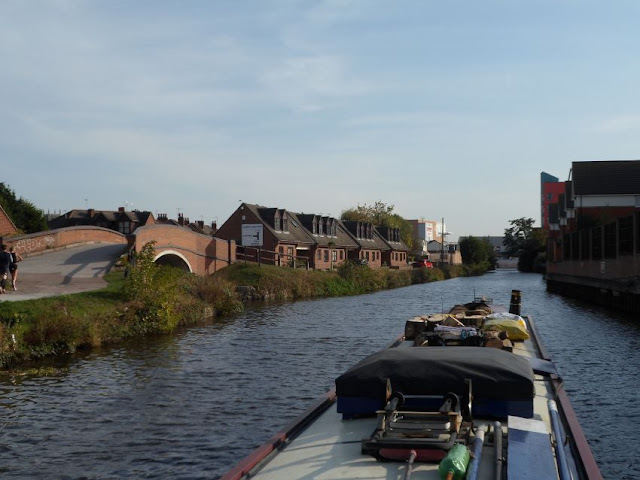 We pressed on up to Mountsorrel, passing the Peter Le Marchant cruise boat Symphony on the way. The lock was empty for us on arrival, so we were through quite quickly. 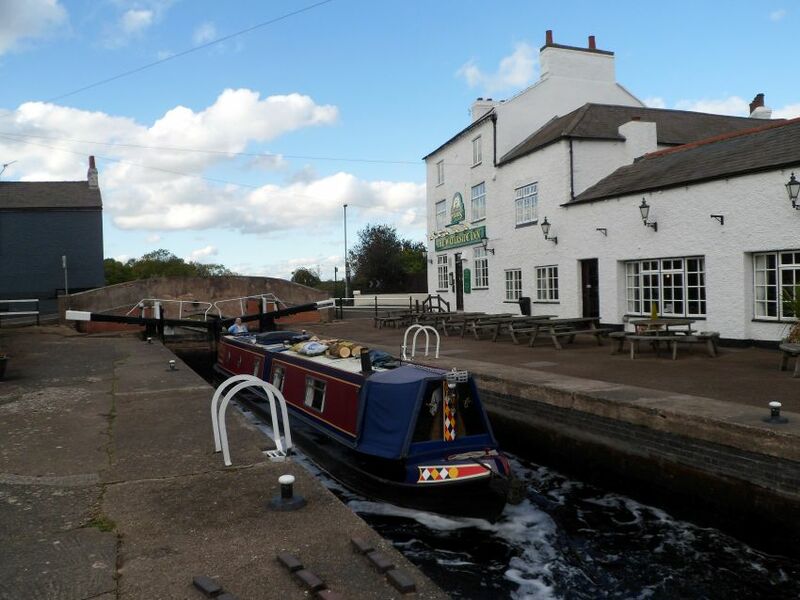 Mountsorrel Lock, with the Waterside Inn alongside. A good spot for gongoozling, but no-one was outside today. 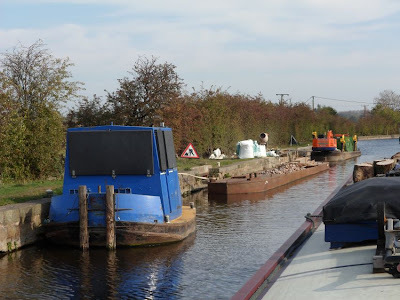 Another 15 minutes saw us tying up to the fuel barge at Sileby Mill. 137 litres of the red stuff and 2 bags of solid fuel made a dent in the monthly budget. Still, the fuel consumption of the central heating (for just an hour a day) and the engine is still less than a litre an hour. 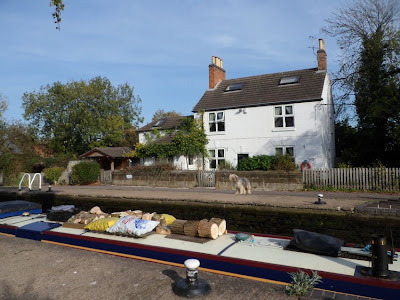 We were going to stop here below the lock for the night, but local anglers had taken up residence so we turned around and moored above Mountsorrel Lock instead. Near Mountsorrel we spotted this horse snacking on duckweed. 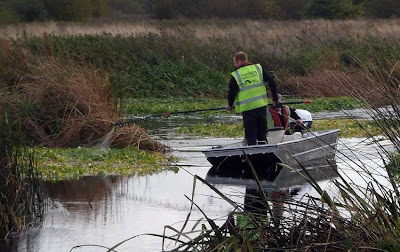 If they could be trained to enjoy Floating Pennywort instead, they might make more of an impact than the contractors spraying the stuff! I spent a jolly hour and a half this morning cutting up my foraged wood. I found some more last evening after we’d moored so “liberated” that as well. We’ve quite a bit of cut wood now, and the roof looks tidier than it did yesterday. With that done it was nearly midday before we got under way. Although bright it was a bit breezy, and cool with it. Still, it was very pleasant cruising, a few boats about and fine scenery in the Soar valley. The wide reach above The Otter. We passed Carol’s boat at Devil’s Elbow, gave a toot but no-one was home. They must have been out for a walk. Less than an hour’s cruise saw us arrive at Zouch Lock. 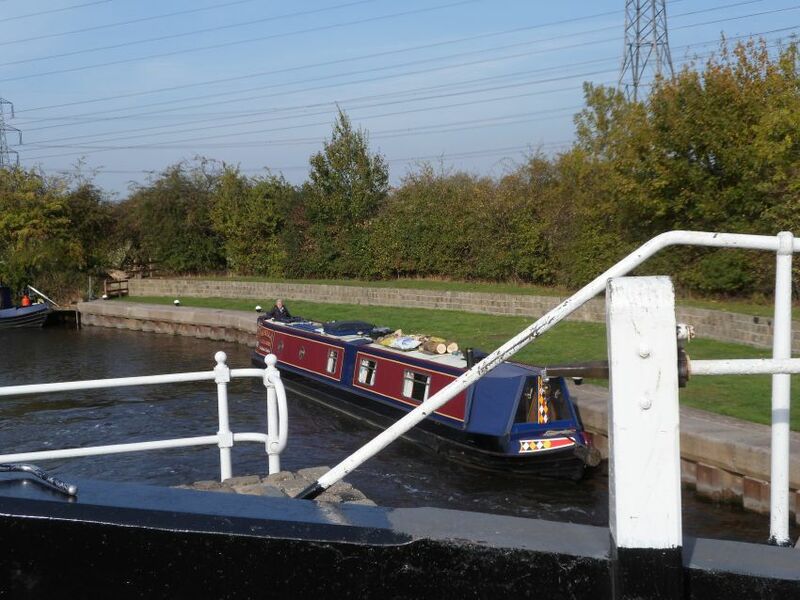 A couple of boats had passed us going downstream, so we guessed that the lock should be empty. It was, a boat was just going in, and they invited us alongside. BW’s contractors are busy mending the towpath above the lock. I say busy….. I guess it must have been lunchtime. 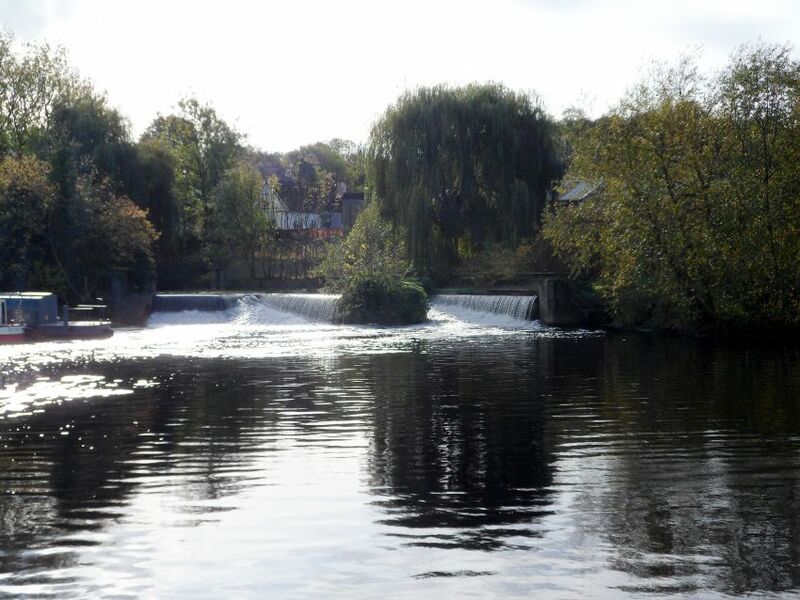 The smart houses on the river in Normanton looked well in the sunshine. 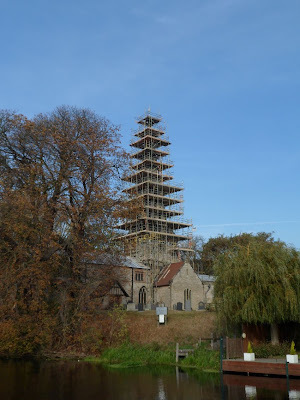 St. James, Normanton, is having some work done on the spire. The scaffolding is a work of art in itself! It’s been transformed into something resembling an a far-eastern pagoda…. To continue the theme…. one of the many power distribution pylons around the valley. I guess that’s the unfortunate consequence of having a large power station on your doorstep. 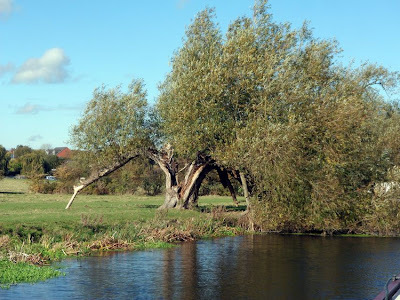 The next lock was Bishop’s Meadow on the edge of Loughborough. 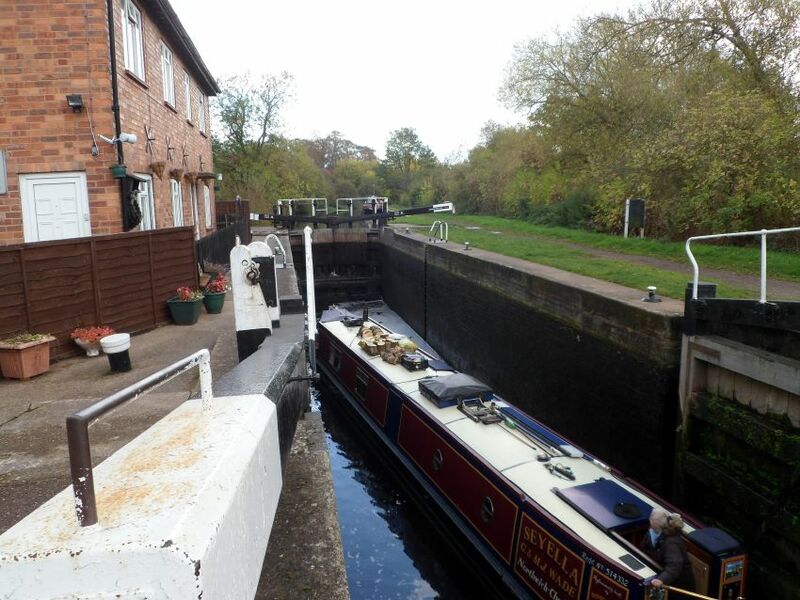 Loughborough Lock has a fine lock cottage alongside, of course now privately owned. At Chain Bridge the Leicester Navigation meets the Loughborough Navigation. The through route up to Leicester is a sharp left turn under the bridge. Straight ahead takes boats a short distance to the terminal basin of the Loughborough Navigation. This has recently been redeveloped, and now offers mooring pontoons and a service wharf, overlooked by university student accommodation. Looking towards the terminus, Chain Bridge and the Leicester Navigation on the left. 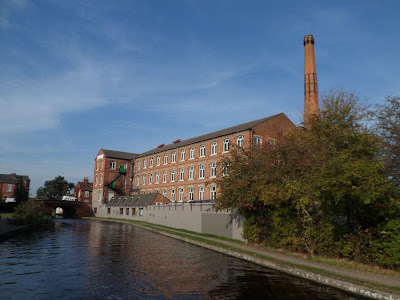 The Loughborough Navigation was constructed in 1778 to take advantage of the coal now coming down the recently opened Erewash Canal from the Nottinghamshire coalfields. It was immediately successful, the price of coal in the town dropping considerably. This encouraged another group of entrepreneurs further south to build another, linking, canal. 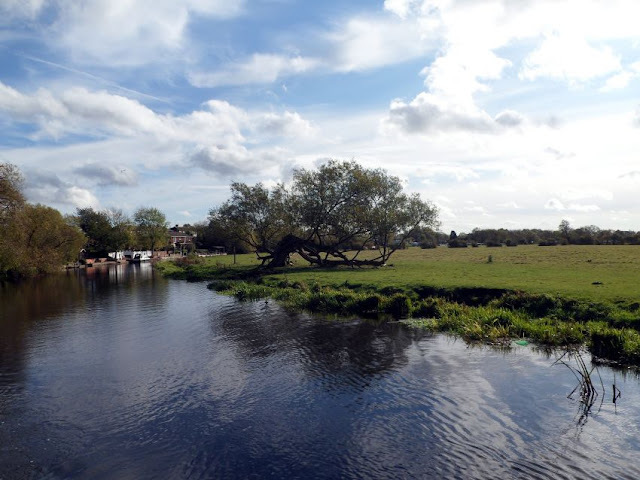 Like it’s northern cousin, the Leicester Navigation uses a mixture of artificial cut and river sections, with tree-lined broad meanders then abrupt changes of character to sharp edged straight “cuts”. Heading south from Leicester is the wordy Leicestershire and Northamptonshire Union Canal, leading to Market Harborough and up Foxton Locks to the Old Grand Union Canal, heading to join the Mainline at Norton Junction. All these canals were incorporated into the Grand Union Canal (Leicester Section). A reminder of an industrial past, a mill complete with chimney stands alongside the canal at Nottingham Road Bridge. There’s very little industrial architecture still left along the navigation. We pulled over just out of town at Millers Bridge. It’s unusual to have nobody here. Close enough to the town to be convenient, it’s often the haunt of “continuous moorers”. Then again, there were quite a few boats moored in town. Outside The Albion was full, and there were maybe half- a-dozen just after Chain Bridge. 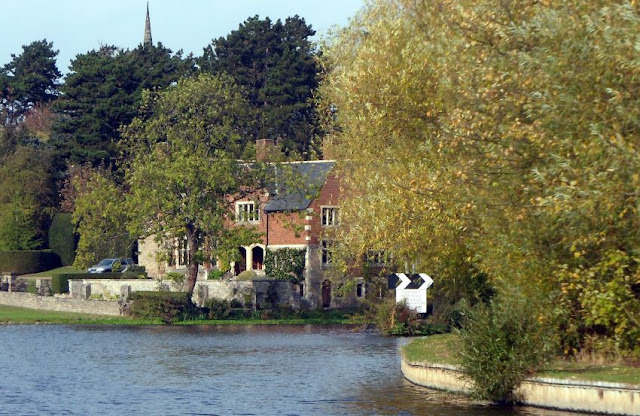 We’ll toddle off down to Sileby tomorrow, to fill with diesel at Sileby Mill. Then we’re pottering till Friday when we take up a visitor mooring in Pillings Lock Marina for a long weekend. I’ve sent off my “doorstep” sponsorship for The Great North Run. Together with the online funds donated through Justgiving, we’ve raised £420 for Macmillan Cancer Support. Many thanks again to everyone who helped out. I got an email from Macmillan, a newsletter really, and they’ve received nearly a quarter of a million pounds through sponsorship for this event alone. Wow! Down the Trent, then up the Soar, of course. We had a lazy day yesterday. Well, I say lazy…. after a seven mile run, Meg’s walk, a trip to the shop up in Sawley, then engine checks, battery topping up and emptying the stern tube drip tray I was ready to put my feet up! Carol left us to it later in the afternoon, cruising down to Redhill for the night. 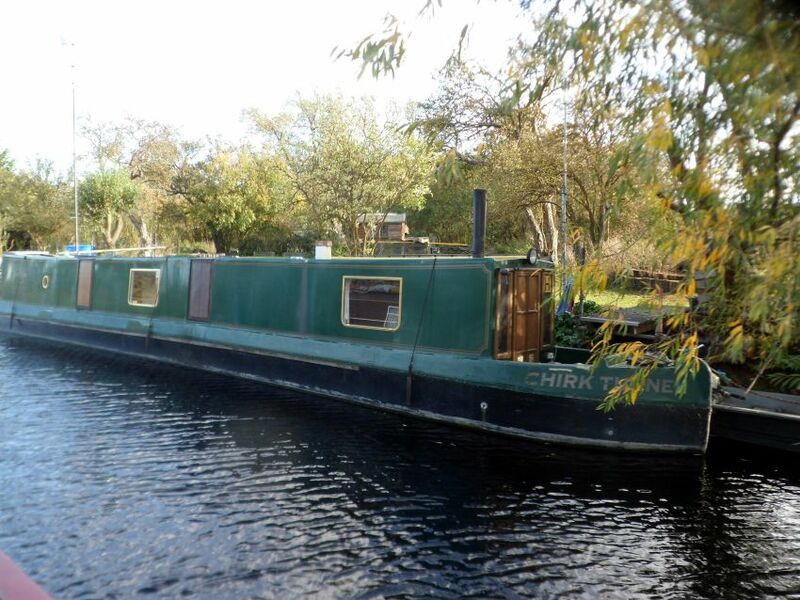 Her space was soon occupied by a returning Canaltime boat. There’s a continuous stream of these hire boats arriving at or leaving from Sawley Marina. 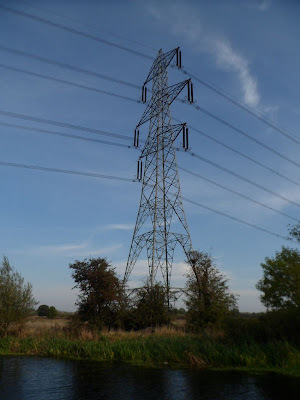 After a mild night I was up for my long run, a planned ten miler turning into eleven as the access to Attenborough Nature Reserve I’d intended to take was closed off, necessitating a diversion further north. Then a quick walk for Meg, another trip up to the Co-op and we were ready for the off. Stranded trees on Sawley Weir. 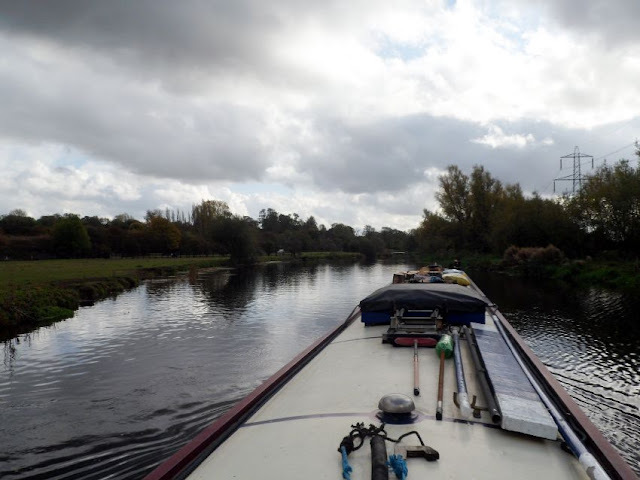 On Sawley Cut heading for the locks, Ratcliffe Power Station dominating the horizon. There are two lock chambers here, side by side and power operated. 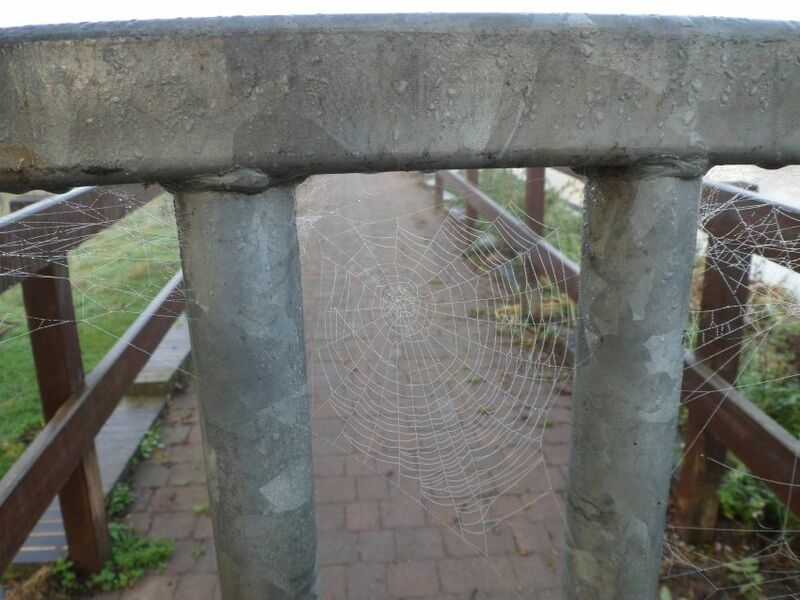 No heaving on balance beams or winding paddles on these! In fact it was even better than that. 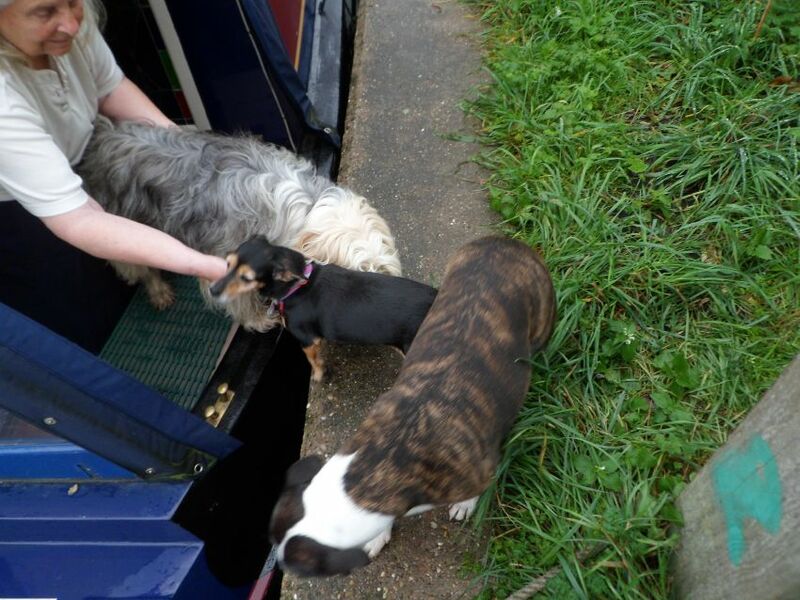 We had a BW lock keeper looking after them today, so I didn’t even have to push a button. Below the locks we turned sharp left back under the railway bridge to visit the service wharf, then turned around again and headed down to the junction with the River Soar. Leaving Sawley. The service wharf is under the bridge to the right, the locks to the left. It’s less than a mile to the junction, which can be a little daunting if you don’t know where you’re going. Straight on takes you on to Cranfleet Cut and points north via Nottingham, left up Trent Lock is the Erewash Canal, 12 miles and 15 locks up to the terminus at Langley Mill. 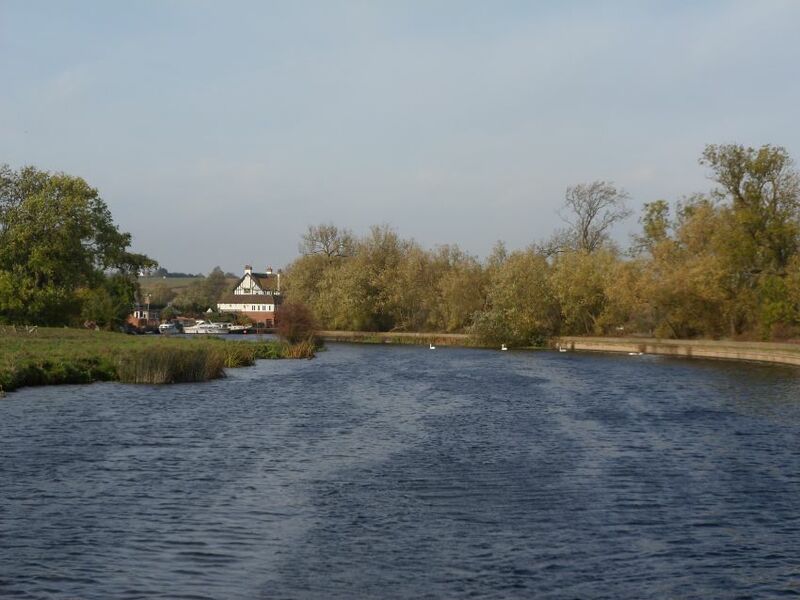 Our route onto the Soar is to the right, then keeping right to avoid the large Thrumpton Weir. The Trent Valley Sailing Club sits on the junction. Now heading against the current coming down the Soar, we passed the fine riverside houses tucked up under the red clay and sandstone hill which gives Redhill it’s name. I fancy one of these. You can see the “Red Hill” behind the properties. We passed Carol just the other side of the flood lock, giving a toot and a wave, then chugged slowly past the long line of moored craft to Ratcliffe Lock. There are some good views of the eight cooling towers at the power station along this stretch. This lock was handily empty for us, and I closed up and started to fill just as another boat came around the corner below. There was only about a foot of water in the lock so I closed the top paddles and emptied it again, inviting them in. Phantom is a 36 year old Springer. These boats were certainly built to last; there’re a fair few of them still around. 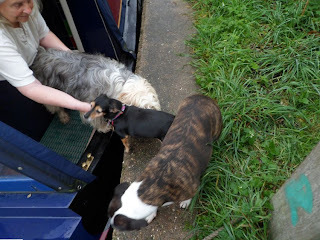 Spying a blown-down tree branch close by, we paused in the lock to retrieve it, Dave off Phantom giving me a hand. All securely on the roof, we set off again, around 2 miles to Kegworth. 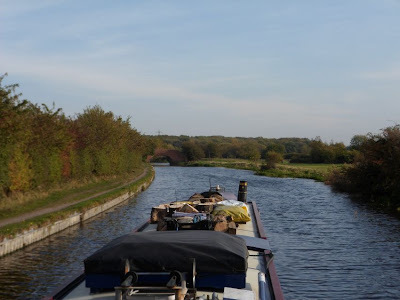 Cruising on the Soar near Kegworth. Kegworth Shallow Lock, now flood control only, so normally open both ends. We had to wait for a boat going up and another coming down before our turn in the deep Kegworth Deep Lock. Coming up Kegworth Deep. You wouldn’t want to open all the paddles with a full length boat in there. 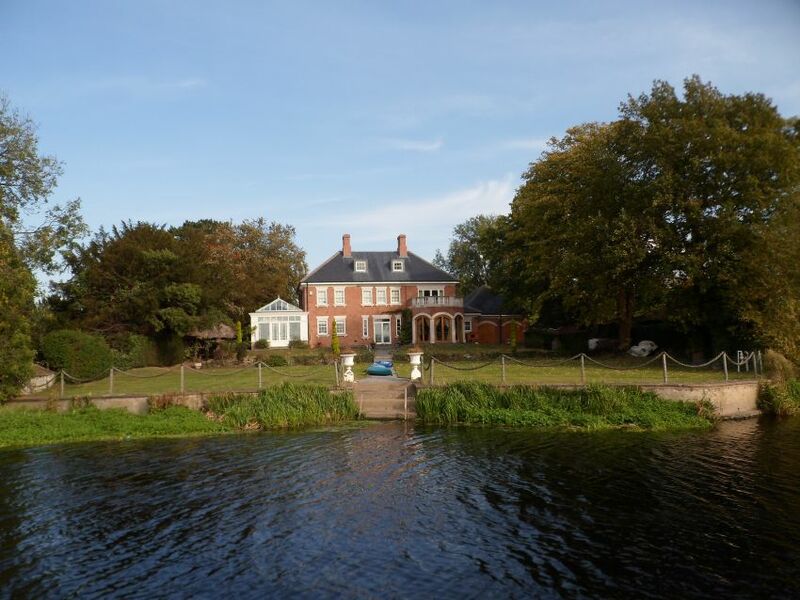 We pulled in around the corner, just past the large house sitting alongside the weir stream. The water is maybe a couple of inches below what you’d normally expect, we ran onto the bottom as we tried to come in. Shuffling back gave us enough depth to get in, though. Looking across the roof (and the wood) from our mooring. The wind has been annoying today, not particularly difficult to handle, but at least it’s been mild. More of the same tomorrow, apparently. Don’t you just love British weather.